Quite an active week ahead. Sunday will be cooler with some passing high clouds, but still dry. 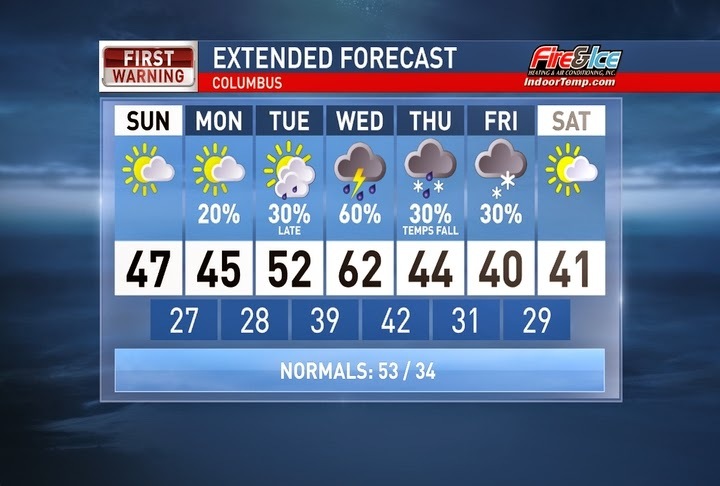 Monday we will have increasing clouds and a weak disturbance could bring some late-day flurries, mainly for Southwestern Ohio. We then warm up with some late-day rain Tuesday and a chance of thunderstorms on Wednesday with a very strong cold front. Forecast models showing a strong punch of cold air by the end of the week. Temps fall fast Thursday and we could see some light snow showers late Thursday into Friday. Have a good one!